The Moto X got its price cut to $400 on January 1, then there was a temporary discount later the same month and now there's another one. If you missed that one, you'll be pleased to hear there's yet another discount. 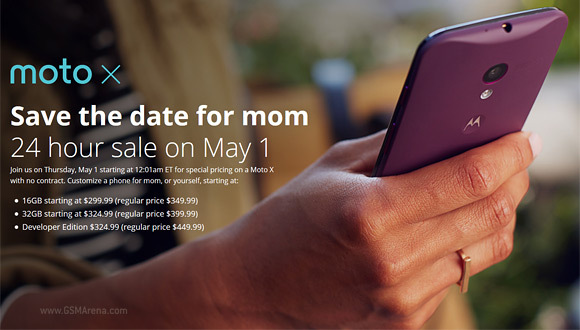 Motorola will offer a discount on the 16GB, 32GB and Developer versions on May 1 only. The offer is available tomorrow, May 1, from 12:01 ET and will last 24 hours. Unfortunately, this price cut is US-only. The phones are carrier-free and you can customize them. Stupid people should stop frowning over here, this is the best phone I owned much better then all the other other over priced over specs garbage . This actually feels like a real smart phone.